Post written by Gavin Do, Assistant Director of Archives and Special Collections at GFBNEC. The only thing is this, that—I guess I haven’t come up with the saying yet, but the thing that I lost was the worst, and that’s what makes me stronger. And that is, when you were thrown from a free life into a camp without a trial, and just thrown in there by your government, they have taken your freedom away from you. Okay, this is not like going into jail and put behind barbed—behind bars and having your freedom taken away from you, this is a freedom that is inside of you and the only way I can explain it is like somebody taking a knife and cuttin’ your heart out, and you can’t explain it. And you fight for the rest of your life trying to get it back. February 19th marked the 75th anniversary of the day President Franklin Delano Roosevelt signed Executive Order 9066; this infamous act authorized the government to begin forcibly removing Japanese Americans from the West Coast and incarcerating them in desolate camps. There was no trial, no witnesses, and court cases opened decades later proved that the evidence supporting EO 9066 was largely fabricated and inaccurate. The Henry Madden Library at Fresno State presents the 9066: Japanese American Voices from the Inside Exhibition. Go For Broke National Education Center recently received an invitation from Fresno State University to participate in their collaborative exhibition called 9066: Japanese Voices from the Inside, which appropriately debuted on February 19. Materials on display from the Go For Broke National Education Center archives. We had the proud distinction to be the only participant that focuses on the military/veteran narrative of the Japanese American World War II experience. The exhibition strives to encapsulate the incarceration experience of those 120,000 Japanese Americans who were unlawfully detained and incarcerated during the war. It is inherently an impossible task to design one exhibition to describe the experiences of so many, but it also seeks to tell personal stories and to paint a picture of the daily lives of the families. GFBNEC was able to contribute to the exhibition by curating content from their archives that tells the story of the Nisei soldiers who volunteered for service from the incarceration camps. Being displayed are personal photographs, letters, and memorabilia from veterans representing the 100th Infantry Battalion (Separate), 442nd Regimental Combat Team (RCT), Military Intelligence Service (MIS), and Women’s Army Corps (WAC). Visitors viewing display on Opening Day, February 19, 2017. The hope is that by putting these materials on display, the public will gain an understanding of what these veterans went through and what they fought for. 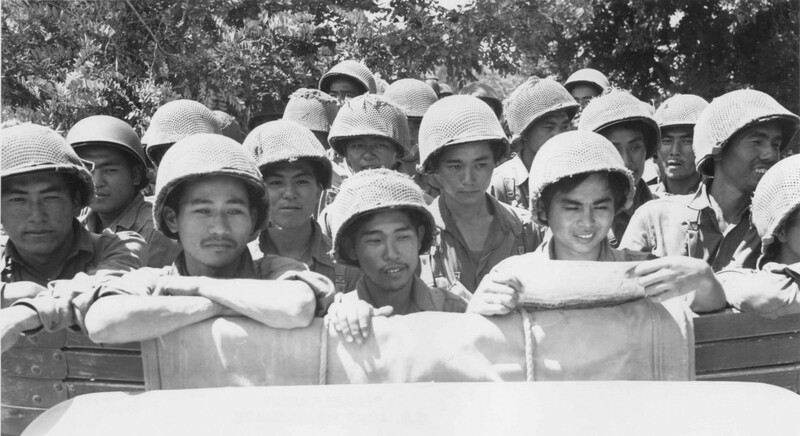 They didn’t simply face adversity on the battlefield, but were forced to face injustices at home; while their families were being detained, these veterans faced worries not just for themselves in the Pacific and European theaters, but also for their loved ones in places like Manzanar, Tule Lake, Gila River, Poston, Granada, Rohwer, and Jerome. Ultimately, my words cannot do justice to the bravery and loyalty of these veterans. Hopefully, the materials on exhibit can help a visitor come to this conclusion: while these veterans are in their own way larger-than-life war heroes, they are also in many ways just normal people that showed extraordinary courage and bravery when it mattered most. These people are parents, spouses, brothers and sisters, like you and me; yet, their actions speak louder than words ever could. I hope that all of us can follow their example and display even an inkling of the courage they have. Fresno State’s 9066 Exhibition will be on display until June 2nd, 2017. For more information on the exhibition, please visit https://library.fresnostate.edu/content/9066-exhibition.